Hand blenders are handy as they help in the faster completion of our daily chores. Be it making protein smoothie every day or making Roti dough, a hand blender eases you task with perfection and saves your kitchen time. We understand that selecting the best hand blender for your need can be really confusing. So when we started looking for the best hand blender, we realised based on various research that there are few key parameters that make a hand blender perfect for your household usage. Based on these parameters, we came up with following top 5 best hand blender that is well suited for most of your household needs. Note: Blender can do small extent of paste but not fine, it’s not alternative to mixer and grinder. It won’t give you paste. This MQ 7 series is a hand blender from Barun that features Smart Speed control, a revolutionary technology which makes your task of blending smooth and fast. You can easily adjust the hand blender speed by gently pressing the speed regulator button depending on the type of material to be blended. Its extra-large button allows you easy and comfortable handling. You can easily prepare all your recipes with one hand, changing the speed in real time, without interruptions. Barun MQ 775 blender has a powerful 750-watt motor and ultra hard stainless steel blades, angled in opposite direction which allows you to do mincing of tough materials like Meat, hard cheese, nuts, carrots and more in one go. Barun MQ 775 blender comes with following accessories to ease your cooking task. 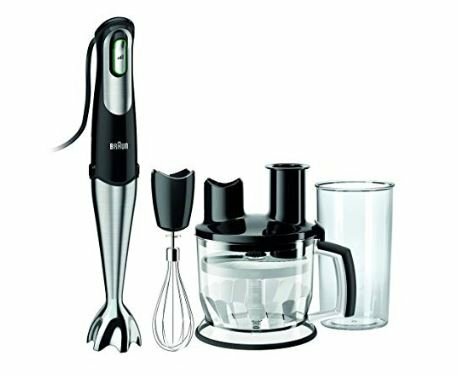 The hand blender is perfectly suitable for preparing dips, sauces, soups, mayonnaise and baby food as well as for mixing drinks and milkshakes. With its stainless steel ice crushing knife, you can easily crush ice. The shredder insert gives you the perfect consistency for the fruits and vegetables in your dish, with slicing insert you can make wonderfully even slices for salads, gratin or casseroles. It’s 600 ml plastic beaker is BPA free and features ml and fl oz measurement markings. You can whisk easily whips, beats and stirs eggs, cream, fluffy dessert from low to high speed with its accessory. This featured rich blender is easy to use along with it is easy to clean and maintain because of its easy detachable shaft. It won’t spill any material at all while making shakes. Note: For best blending results use Barun MQ 775 blender at highest speed with its smart speed control. Blend tasty smoothies and shakes with Robot Inox 1000 Hand blender from Inalsa that makes everyday food preparation fun and easy with its high-quality features. Featuring a lightweight design, this blender is crafted in black and grey colour. The ergonomic handle and detachable SS Stem make it an easy to use appliance for both beginners and experts alike. With the super sharp blades in the foot, you can easily make purees; prepare baby food or even tasty and healthy smoothies that keep you energized all day. 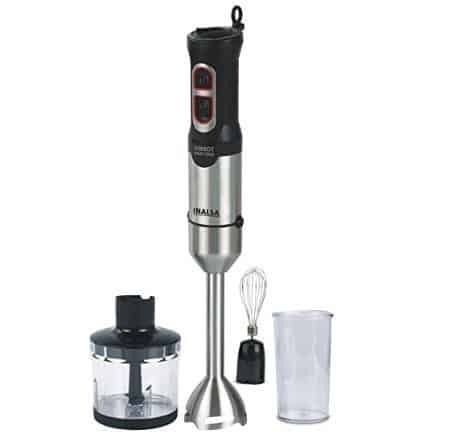 Inalsa Robot INOX 1000 Hand blender is itself a food processor as it has efficient chopper and Whisker. This blender is fitted with super sharp versatile SS blades for perfect results every time. These blades are perfect for blending smoothies, shakes, baby food or even hard food ingredients. Thoughtfully designed, this blender comes with a hanging loop. You can hang the blender post usage for easy drying. Buttons are soft and blades are smooth. Safety Usage Note:- If you do a lot of chopping then use it for not more than 4 minutes and let the motor cool down a bit because the heat will increase and can damage the motor inside. 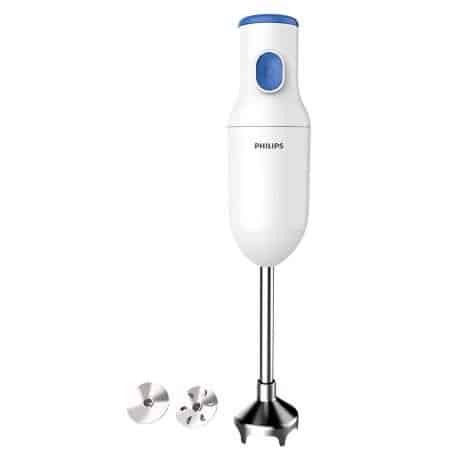 This uniquely designed hand blender from Philips makes blending tasks of materials like cooked dhal and spinach, lassi, puree and milkshakes, very convenient. The product is ergonomically designed along with a rust proof metal arm for a better grip while holding the blender. This blender enables you to quickly blend larger quantities of ingredients for as long as 20 minutes thus making it preferred choice for larger families. Philips HL 1655 comes with two different blades for whipping of cream, eggs and whisking of beverages. The stainless steel arm and removable blades support the blending of cold and hot ingredients. The steel is less corrosive and is a food grade material making it safe to use. This blender from Philips features additional wall bracket for easy storage of the appliance. The product has 250W powerful motor that even supports the processing of tough ingredients like meat, hard cheese, nuts, and carrots. Philips HL 1655 comes with single trigger press with easy to hold feature for the quick blending of ingredients. The unique body shape of Philips HL 1655 without grooves on the body surface ensures easy cleaning. It’s no spill blending process make this blender your perfect choice for making strawberry lassi, apple milkshake, whipping cream etc. 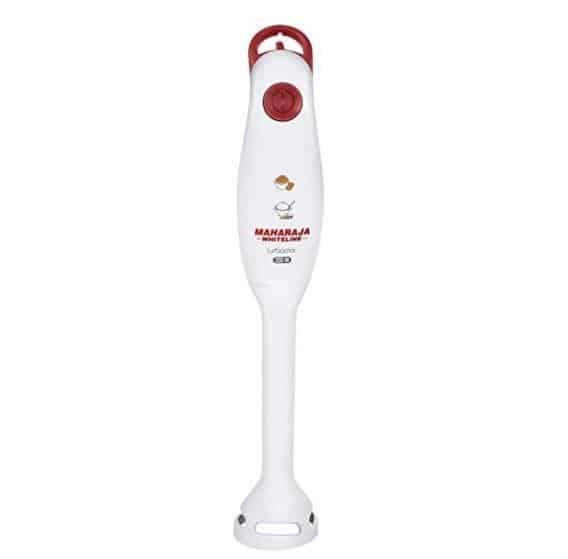 Maharaja WhitelineTurbomix Hand Blender comes with a powerful 350-watt motor that consumes very less power and offers you the best of blending. It allows you to make tasty shakes or whip a cream or egg or a dip for any dish that you are planning to cook for your family with much ease. Maharaja WhitelineTurbomix has an ergonomic design which makes it pretty easy to use without much hassle. It’s push button is also fixed on the curved end for ease of use. This super effective hand blender from Maharaja Whiteline doesn’t clutter your kitchen and its hanging loop allows you to keep it hanging on your kitchen wall. The blades available with Maharaja WhitelineTurbomix 350-Watt Hand Blender are sharp and very effective to give you the perfectly blended shakes or whipped cream and more in minimum time. The foot of the hand blender is detachable and made of plastic, thus making it easy to clean. With the super sharp blades in the foot, you can easily make purees; prepare baby food or even tasty and healthy smoothies that keep you energized all day long. Whether it is blending a smoothie for breakfast or mixing dough for baking this Orpat HHB-100E 250 watt hand blender is a great appliance to simplify your daily mixing and blending tasks. 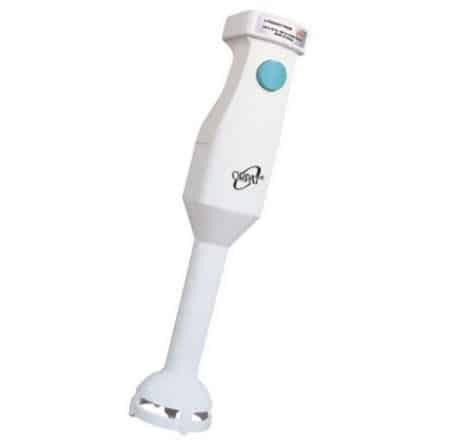 Orpat hand blender is powered by a heavy-duty 250W motor that performs all tasks relentlessly and quickly. The extremely comfy grip is another added advantage as it makes it easy to handle thus making this blender easy for one hand operation as well. This blender is also energy efficient, allowing you to save on your power bill. Orpat HHB blender comes with 2m cord length which allows you to use this blender even if power socket is at distance. With its 6-speed function and super sharp stainless steel blades, this blender allows you to have proper control while crushing and churning vegetables and fruits efficiently. Orpat HHB 100E blender is also extremely light and handy. This blender can also be mounted on a wall and because of its compact size; it takes very little space in your kitchen. The sleek, contemporary style with ergonomic handle and control switch feels comfortable in your hand and makes cooking operation quick and easy. As all the washable parts of this blender can be easily detached from the motor, it is much easier to clean after usage. Orpat and Maharaja Whiteline Turbomix hand blender are perfect for daily usage purpose. Both of this blender is also easy to maintain and value for money. Barun MQ 775 blender and Insala Robot INOX blender serves as a complete food processor and comes with accessories that is handy in day to day usage. Compared to Barun MQ 775 blender you may prefer Insala Robot INOX blender because of low cost and powerful motor.